If you’re to follow many conversations between users on Twitter, you may have noticed that it would be nice to follow a more convenient way. That is, viewing both sides of a dialogue (without clicking the “see conversation”). TweetsBetween is a web application that lets you read the recent conversations between two Twitter users, and in a clear to read. It should be clear that the tool only displays public tweets. 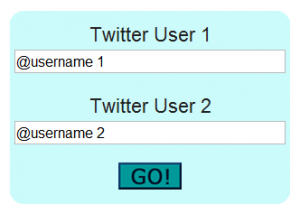 To follow a conversation between two people on Twitter will have to enter user names in the spaces provided in the main interface, then clicking on “Go”. Another interesting feature, which offers TweetsBetween, is the ability to save conversations to read later if you’re short on time. As you will see is a simple online application, which can be very useful for who want to follow the thread of dialogue on Twitter with more clarity and also a little gossiping.